You simply won’t get a better commercial cleaning service elsewhere. Our clients often comment on the high calibre of our staff. Our ‘green’ policy is integral to all our activities, so you can be sure that you will receive an environmentally sound cleaning service. Our specialist skills and experience allow us to safely and successfully maintain your timber, stone and other hard flooring. In case of any cleaning emergencies we have staff available to assist you, 24/7. 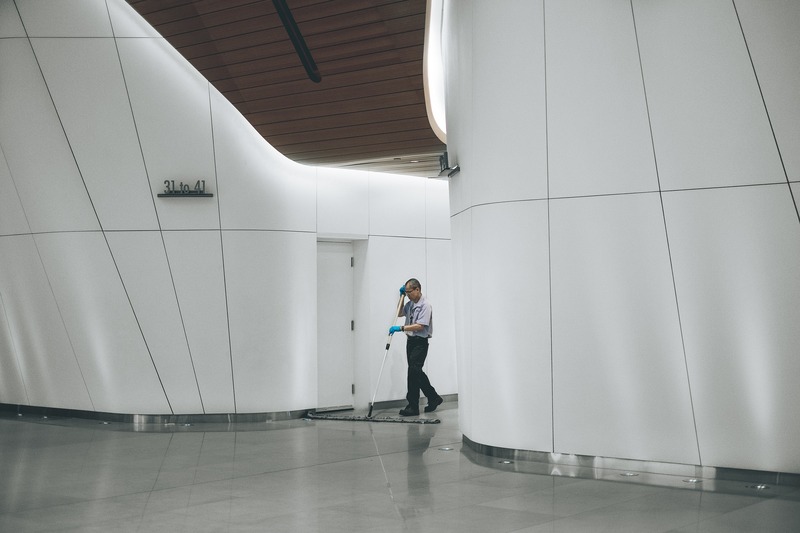 When you employ Enhance you can rest assured we fully understand and abide by all relevant government legislation surrounding our commercial cleaning operations. If you believe that your cleaning service is a key element in maintaining a safe, healthy and productive environment for building users, and that the cleaners who work on your site should be fairly paid and rewarded for a good job, then we are speaking the same language. We have used ‘Enhance’ since 2006 and have been very happy with the service that they provide to us. The management team have a hands-on approach and a “can do” attitude which fits very well with the high service levels that we aim to achieve. Your cleaner did a splendid job under very difficult circumstances. She was always prompt, well presented, charming in her manner and took real pride in ensuring the 5 floors she covered were kept in pristine condition despite lots of workmen coming in and out throughout the period. The cleaning team work incredibly hard and provide a quality service for us, along with their reliability and flexibility. We are entirely happy with the service provided and would be happy to recommend the service to others. ‘Enhance’ has supported my NVQ in Management – Level 3. My manager offers friendly support, but gives firm guidance and clear goals. I do feel part of the team and it was great to receive an unexpected gift from the customer at Christmas. The cleaning service which we receive from ‘Enhance’ is a very good one. ‘Enhance’ also service our meeting and conference rooms and keep our kitchens clean during the day. I know that if anything arises related to their service it will be dealt with properly and promptly. I liken my annual Health & Safety review of ‘Enhance’ to a doctor with a 100% fit patient in front of them. I genuinely believe the decision to adopt the London Living Wage sets you apart from the less ethical cleaning businesses and will add value to the business. I know what work I’m supposed to do and I always have the products needed to perform my work. Things are organized very well and my supervisor always helps when we need it. The managers of the company are people who care about us and I can talk to them if I need help or information. I feel respected in my work. Following the recent customer satisfaction questionnaire which I received I wanted to back this up by confirming that the service level which we receive from ‘Enhance’ is always extremely high. We can always rely on your staff and really appreciate that your management is only a phone call away if needed. Just wanted to say how amazing your day time housekeepers are. We have had some very positive feedback and they do a blinder of a job. It would be nice to relay this back to them. Right from the start of my employment with ‘Enhance’ it was obvious that a professional approach is taken by the company to both its clients and employees. My experience is that people who work for ‘Enhance’ take pride in their jobs and treat their work seriously. Enhance is a very well organized company. The team spirit is good, and I like that events are organized for employees. Expectations are of a high standard but are feasible. I like my job, and being a supervisor at ‘Enhance’ is a good position and I feel a good career opportunity. A quick note to say thanks very much to you and your team for an excellent weekend of carpet and ‘lino’ cleaning. The hallways, kitchens and office services look brilliant. Thanks again. I have personally known Sandy for over 20 years and he has always shown great integrity and honesty. He is a hard worker, determined and always puts his clients first. His attention to details means that his clients get the best out of him and his company and get the best value for money possible. In my experience over the past 13 years of working within the property industry, ‘Enhance’ has been by far the best cleaning company I have worked with. The staff are genuinely conscientious about their work and always go above and beyond to help in any way.